What saved baseball after the 1994 strike? In a point-countertpoint, WTOP Entertainment Editor Jason Fraley says it was Cal Ripken's Iron Man streak. This is one side of a point-counterpoint on what saved Major League Baseball following the 1994 strike. For the other side, click here. Who saved baseball? It’s a debate that rages with regional rivalry. The Midwest loves to credit St. Louis’ Mark McGwire and Chicago’s Sammy Sosa for their home-run chase in 1998, while the West Coast likes to think San Francisco’s Barry Bonds catapulted it further with his record-breaking season in 2001. However, we Marylanders know there’s really only one right answer. Cal Ripken Jr. saved baseball. The culmination of his 2,131 consecutive games streak on Sept. 6, 1995 cleansed the stain of Aug. 12, 1994, when a player’s strike canceled the rest of the season. To this day, Montreal Expos fans cite their league-leading 74-40 record as a truncated example of “what could have been,” a painful reminder for a franchise that would soon become the Washington Nationals. Most egregious, even blasphemous, was the cancellation of the World Series, the first time the beloved annual tradition disappeared since 1904. It was a sin worse than Shoeless Joe Jackson throwing the 1919 World Series, only this time there was no “Field of Dreams” for a penance. Or, on second thought, there was. Baltimore had just built a new ballpark in 1992, leaving the Memorial Stadium of its glory days to create an oft-imitated retro sanctuary carved into the side of a warehouse. Its mantra: “If you build it, he will come.” The “it” was Oriole Park at Camden Yards. “He” was Cal Ripken Jr.
At a time when jaded fans swore they’d never watch again — angry at greedy millionaires — along came lunch-pail Cal punching his time card and playing the game the right way: “The Ripken Way.” His workmanlike approach was so understated that outsiders underrated his elite on-field accomplishments: World Series champion, Rookie of the Year, two-time Most Valuable Player, multiple Gold Glove winner and the most home runs ever by a shortstop. Yet it was his consecutive games streak that etched him into history, as a nation discovered that a mere mortal didn’t miss a game from May 30, 1982 to Sept. 20, 1998. Presidents golfed, company executives took vacations, athletes held out for bigger contracts. Ripken played. It unfolded in a fitting location, just blocks from the birthplace of Babe Ruth, whose teammate Lou Gehrig previously held an “unbreakable” streak of 2,130 consecutive games played as the “pride” of the New York Yankees. The Iron Horse was immortal, his legend growing all the more since his streak had only ended due to a mysterious disease that now bears his name. And yet, half a century later, it was Baltimoreans who felt like “the luckiest fans on the face of the earth.” The buildup was magic. 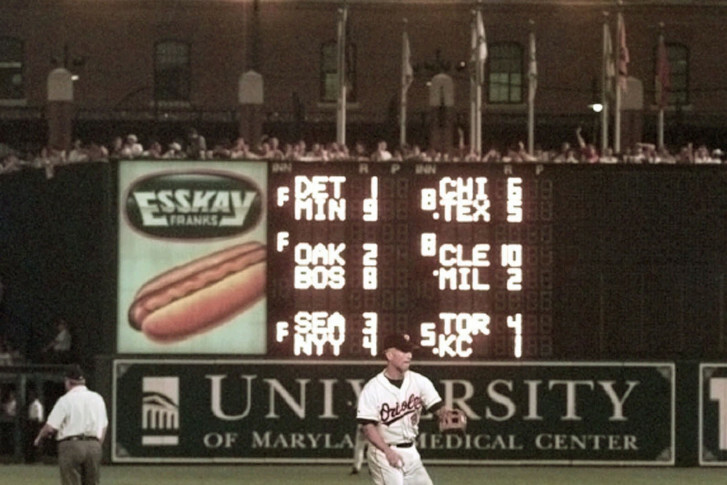 As Ripken neared the historic night, giant numbers fell on the warehouse with each game: 2123, 2124, 2125. My family drove from Frederick to attend one of the final 10 games, then watched each successive game on television until the big night arrived, where we gathered around the TV set with my grandparents to witness history. If you didn’t watch it live — or you’ve only seen clips on YouTube — I highly recommend going back and watching the entire event. It’s no exaggeration to say that — save for George W. Bush throwing out the first pitch after 9/11 — there was an unrivaled level of pageantry. A parade of celebrities visited the pitcher’s mound after the game to pay their respects, while President Bill Clinton and Vice President Al Gore watched from their suite above. Clinton even entered the Orioles locker room, swiping Bobby Bonilla’s camcorder to film the occasion. Other sports icons came bearing gifts: NFL Hall of Famer Johnny Unitas, Maryland Terrapins basketball coach Gary Williams with his No. 1 NBA draft pick Joe Smith, future NBA Hall of Famer David Robinson, tennis star Pam Shriver and Olympic gold medalist Bonnie Blair. The event even attracted figures from the entertainment world. David Letterman unveiled a Top 10 list over the jumbotron, “Mr. Baseball” Tom Selleck delivered a commemorative bat, and the cast of “The Young and the Restless” recorded their own sultry sketch in tribute. Rock & Roll Hall of Famer Joan Jett sang the national anthem on the night Ripken tied the streak, while pianist Bruce Hornsby and saxophonist Branford Marsalis played their Grammy-winning rendition the night he broke it. The duo even paused long enough for the crowd to chant their signature “O!” as Marsalis pumped his fist (No, the tradition isn’t offensive; you’re allowed to do it when you’re in the very city where Francis Scott Key penned the anthem). I’m not exaggerating when I say this: Grown men and women wept that day. Three years later, baseball exploded to new popularity with the home-run race between McGwire and Sosa, but it felt like a new president taking credit for a booming stock market when the recovery was already underway. Ripken resurrected the game with grace, class and a steady hand, while the bloated McGwire, Sosa and Bonds artificially inflated it — just so it could come crashing down again. Their greed stained the game. Cal’s selflessness healed it. There’s no debate. No need for asterisks. No need for controversy. It’s not even close. The Iron Man saved baseball.